Code in the Community is a Google-sponsored initiative to bring free coding classes to 3,000 young Singaporeans from less well-to-do backgrounds. A multi-year, multi-level computer science and computational thinking course, it aims to get even more Singaporean kids excited about the potential of technology, and unlock their natural learning abilities. Thank you very much for your interest in Code in the Community. Please click below to register your child for a class. Please submit ONE response PER CHILD. IF YOU ARE UNABLE TO REGISTER FOR RUN 2, LEAVE US YOUR DETAILS BELOW AND WE’LL REACH OUT TO YOU WHEN REGISTRATIONS FOR RUN 3 STARTING 17 AUG 2019, ARE OPEN. Build a strong foundation in computational thinking using Scratch, an introductory, block-based programming language developed by MIT that is increasingly being introduced in Singapore schools. Fun and interactive exercises make this course enjoyable for all new learners! Be introduced to basic computer science concepts using popular text-based programming language Python. Students learn fundamental programming knowledge as they build real world applications, opening their eyes to the technology that is all around them. Volunteer registrations for the May-Jul run are open! Familiar with Python and/or Scratch? Enjoy working with kids? Use your programming skills - and share your coding journey - to inspire the next generation of engineers, tinkerers and problem solvers! Instructors and assistant positions available, with a minimum commitment of 6 weeks. CIP hours eligible. Code in The Community welcomes corporate and school volunteers looking for CSR initiatives in tech education. With a minimum of 5 volunteers, we can set aside a dedicated session for your team to teach, with training at your organization and acknowledgment on our website and across our public relations efforts. What is Code in the Community? Code in the Community is a Google-sponsored initiative to bring free coding classes to 3,000 young Singaporeans from less well-to-do backgrounds over 3 years. How do I sign my child up for Code in the Community? You can sign your child/children up for Code in the Community at www.codeinthecommunity.com. Please note that you will have to fill up 1 registration form per child. Who is eligible to join Code in the Community? If you believe your family falls into the category of low income, but do not belong to any of the above schemes, please contact your respective Self-Help Group to determine your eligibility. What is the schedule for Code in the Community? Code in the Community is a 20-hour program, conducted over 10 lessons of 2 hours each. The lessons take place once a week, on either Saturday or Sunday. Where is Code in the Community held? 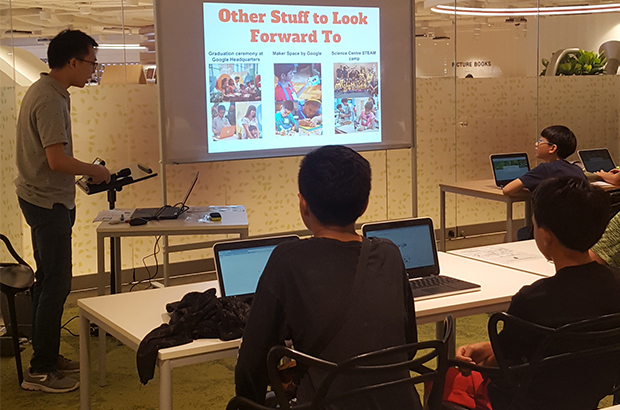 Code in the Community takes place at various libraries, community centres and other public buildings around Singapore. Venues may change from run to run. You are welcome to pick the Code in the Community venue most convenient for you, subject to space availability. What do I need to pay / is there any obligation for taking part in Code in the Community? Code in The Community is a free program, with all 10 lessons sponsored by Google, in partnership with the four ethnic Self-Help Groups (CDAC, MENDAKI, SINDA and Eurasian Association). While there is no cost to participating in the program, we ask that your child be committed to attending the classes in order to receive the full benefit of the program. Students with 80% or higher attendance will receive a Certificate of Graduation, be eligible to take part in a graduation celebration party at Google Headquarters, and may be invited for free follow-on programs or holiday camps. All equipment (laptops etc) will be provided. We recommend that your child brings a water bottle, a jacket and a notebook to take notes if they wish. Is there any certificate or award for taking part? Students who achieve a minimum of 80% attendance (attend 8 out of 10 sessions) will receive a certificate of graduation through email at the end of the program. What and when is this Google ceremony? The Google graduation ceremony is a chance for students meet others in the program and explore the Google office. Only students who have achieved a minimum 80% attendance will be invited. The ceremony will be held in the second half of the year, details will be shared closer to the date. My child took part in Code in the Community before. Is this a follow-on course? Can they join again? This is not a follow-on course. However if your child has completed the Scratch Program in the previous Code in the Community, he/she can register for the Python Program if the age requirement is met. Volunteers can take part in this program as either instructors or assistants in the classrooms. Anyone who has basic knowledge of Scratch and/or Python and has a passion to teach can register to be a volunteer. How long does it take for my volunteer application to be approved? For new volunteers, it should take about 1 to 2 weeks for us to review your submitted projects and approve your application. For returning volunteers, we will be in touch with you once have completed the volunteers allocation process. Can I choose my preferred locations and timings to volunteer at? Yes you may indicate your preferred locations and timings on the registration form. However, please do note that we cannot guarantee that you will receive your first choice of location/timing. What are the benefits of volunteering with Code in the Community? As a token of our gratitude, instructors receive a stipend of $20 per hour of classroom teaching time. Assistants are not eligible for a stipend; however, assistants who are full-time students may note that hours spent volunteering with CITC are eligible for CIP hours. I would like to volunteer with friends. Can we volunteer as a group?